November 2018 27 with a simple burner and propane gas, which then became a signature feature for her company. 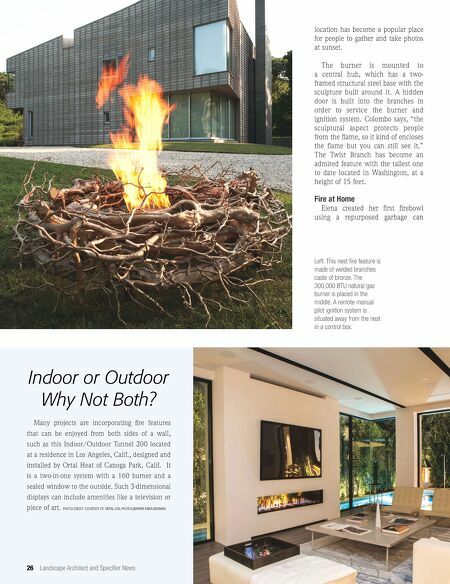 Colombo remarked that the firebowl is a great standard feature to have in the home, because it allows the homeowner to engage in a more "communal activity" with access to the house. A homeowner in Florida decided he wanted something unique featured outside his home, so he connected with Colombo. After exploring the possibilities, he and Colombo agreed to a project. In an interview with LASN, Colombo explained the process. There are vines called Strangler Vines, which grow around a tree and with its larger foliage, cut out the tree's light. The tree starves of light and eventually dies. 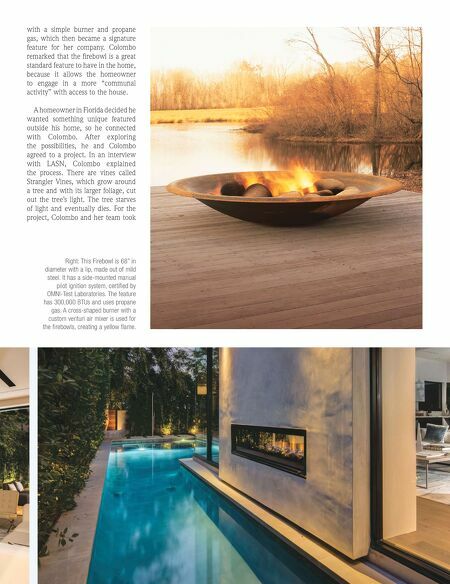 For the project, Colombo and her team took Right: This Firebowl is 68" in diameter with a lip, made out of mild steel. It has a side-mounted manual pilot ignition system, certified by OMNI-Test Laboratories. The feature has 300,000 BTUs and uses propane gas. A cross-shaped burner with a custom venturi air mixer is used for the firebowls, creating a yellow flame.